Value as an arbitrary construct is made physically apparent in this body of work. 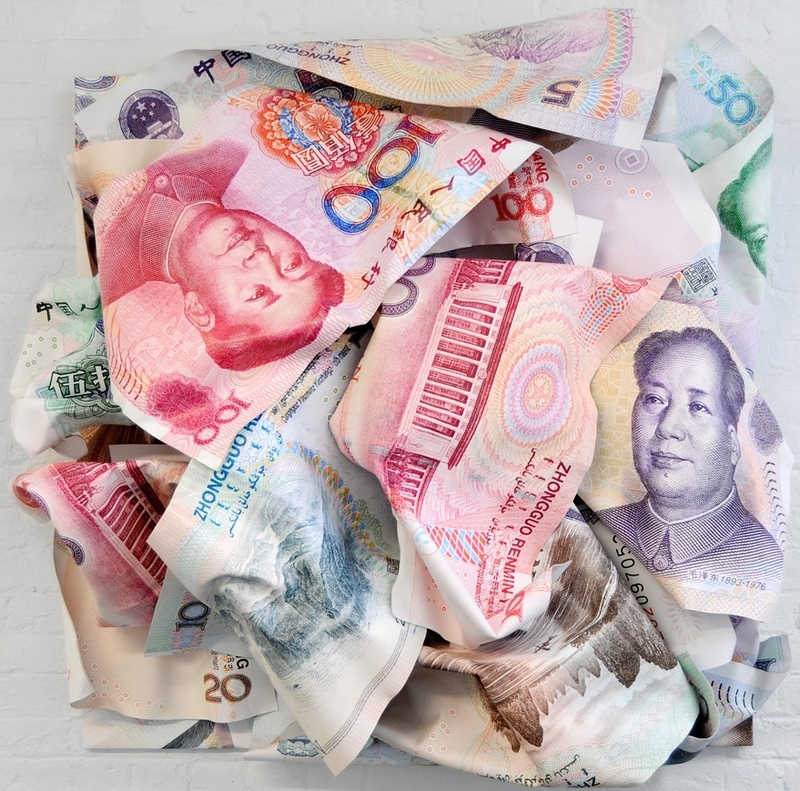 Oversized printed images of money and money bands are laminated onto metal sheets, which subsequently are wadded up and crushed into square clusters and cubic blocks of literally cold, hard cash. Money as materialism is made brutally conflictive, appealing and beautiful on one hand and underhanded on the other. Using the medium of authentic currency, the artist folds origami shapes such as dragonflies, cows, and roses, each referencing various luxury brands. The arrangement of these shapes, sometimes neatly gridded and other times placed in random formations, convey the smooth appeal of fashion advertisements. The folded paper float idyllically as if grazing on an Arcadian field, yet the coy prick of money delivers a direct critique of the shallow pursuit of materialism. Laminating images of a photographic image of a graffiti American flag onto strips of metal, Becker transforms this iconic symbol into sculptural variations of itself. The metal strips have been cut, twisted and forced into shapes and forms that are then reassembled in a loose geometry of stars and stripes. The robust yet sensuous nature of these flags counter more traditional evocations of pride and patriotism. Whether this bends to an act of desecration or consecration is left up to the viewer.